In a game earlier this month against the Colorado Avalanche, Brock Boeser uncorked a shot off of a face-off, lighting the lamp mere moments after the Pepsi Center’s stoppage music halted. The goal was the 50th of Boeser’s young career, propelling him into legendary company as the second-fastest Canuck in team history to reach the half-century goal mark, trailing only Pavel Bure, who did it in 82 games. There’s no doubt that the Burnsville, Minn., native would have reached the mark sooner if a back injury had not limited him to 62 games last season. On pace for a stellar season, a healthy Boeser would have likely challenged Mathew Barzal for Calder Trophy honors. This season, Boeser is looking to help the Canucks battle for a playoff spot in the Western Conference. While there are a handful of teams in the fray, Vancouver was often left out of the discussion prior to the season. However, expectations have changed in Vancouver, in large part due to wunderkind Elias Pettersson, blossoming center Bo Horvat and the continued development of Boeser. The potential rebuild has been accelerated, especially with the forces of chemistry between Pettersson and Boeser forming a deadly duo. The excitement surrounding the the Canucks young nucleus has reinvigorated the team’s fans British Columbia, who are among the most loyal in the league. In large part, the hype has hummed around Pettersson and Boeser, their talents often intertwining to finish off each other’s plays. It’s forced opponents to take notice whenever the two players are on the ice, because like Boeser’s 50th career tally, the score can change in a hurry if not. With all that skill consolidated onto one line, the focus often turns to not stopping them, but just attempting to limit their opportunities. 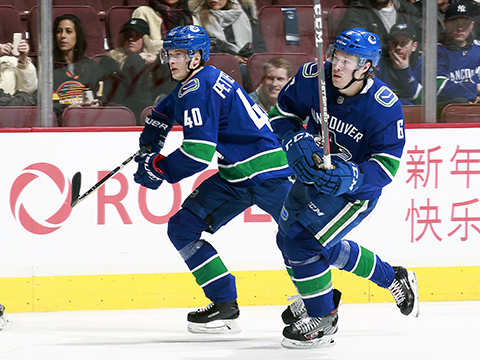 Brock Boeser (right) and Elias Pettersson have Canucks fans extremely excited about the future, and the present. Opponents are quickly finding out that Boeser doesn’t need much time and space to generate offense. The Canucks 23rd overall selection in 2015 combines savvy hockey sense with a quick release to generate scoring chances, making and finishing plays at a high level. But it’s his finest attribute, his release and world class shot that has produced 21 goals so far this year. The North Dakota product – Boeser won a national championship with the school his freshman year in 2015-16 – left after the conclusion of his sophomore year for a nine-game stint with the Canucks that saw Boeser pot four goals. Now in his second full season, Boeser should see a significant pay increase with his entry level contract expiring, thanks and part to goals like this one, mentioned at the start of the article. 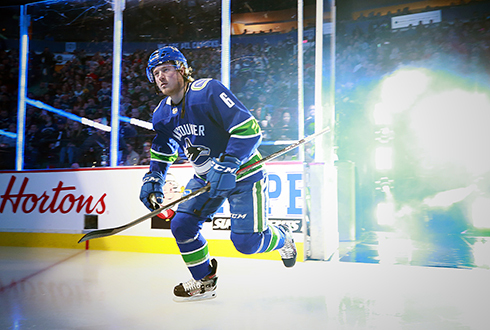 While Canucks General Manager Jim Benning is tasked with putting together a new contract in the offseason, Boeser is focused on the remainder of the season and getting Vancouver to the playoffs. The winger has already picked up a lot of small nuisances he’s felt has helped him grow as a player compared to last year. With Boeser feeling good, opposing goaltenders need to be on high alert. The forward has notched over 21 minutes of ice time in seven of his last 10 games as the Canucks continue to rely heavily on their dynamic forward in pursuit of stamping a playoff ticket for the first time since 2014-15.